An interview with cinematographer ERIC DAARSTAD of THE EXILES – the groundbreaking film made between 1958 – 1961 that chronicles one night in the lives of young Native American men and women living in the Bunker Hill district of Los Angeles. Based entirely on interviews with the participants and their friends, the film follows a group of exiles – transplants from Southwest reservations – as they flirt, drink, party, fight, and dance. Filmmaker Kent Mackenzie first conceived of The Exiles during the making of his short film Bunker Hill – 1956 while a student at the University of Southern California. 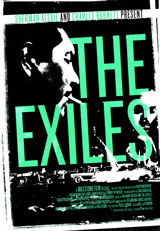 The Exiles was photographed by Daarstad and a group of young filmmakers – Mackenzie’s college mates, fellow employees, and friends holding down a variety of day-to-day jobs in the motion picture industry. Much of the picture was shot on “short ends,” the leftovers of 1,000 – foot rolls (varying from 100 to 300 feet of stock) discarded by major film producers. Milestone, in cooperation with USC’s film archivist Valarie Schwan, brought the film to preservationist Ross Lipman and the UCLA Film & Television Archive. This entry was posted in drama by admin. Bookmark the permalink.